Pra Pim Prasut Jiw - Luang Por Pina Wat Sanom Lao - Miniature Sacred Clay Buddha Amulet with Pra Pang Maha Jakkapat, Pra Mae Toranee, Pra Mae Posop, and Pra Sangkajjai. Due to its Petite size and Graceful Design, this amulet is an Extremely Recommended Buddhanussati Amulet for Ladies and Children, or as a smaller amulet for men to wear as a lateral adornment to a neck-chain with multiple amulets. The Pra Pim Prasut, was made in two different colored Sacred Powders; Black Bailan (only first edition made), and brown-red earthen clay Made from Wan Mongkol, Khaw Sarn Hin, Din Nam Pi, and Pong Wised Powders. The amulets were made in Pim Jiw, Klang, and Yai (miniature, medium and large). The miniature models are the rarest and most highly prized of all three sizes, with the first edition black model being the rarest and most highly prized of all. The amulet represents a manifestation of the Buddha, representing the occasion when King Bhimpisara beseeched the Buddha to help to prevent the King Paya Maha Chompoobodee from attacking the Kingdom of Rajaghiri. The Buddha then created a mirage, and appeared as a great King with a Great Kingdom, before Maha Chompoobodee, to teach the Dhamma and heal that King from Wrong Views and Maliciousness. 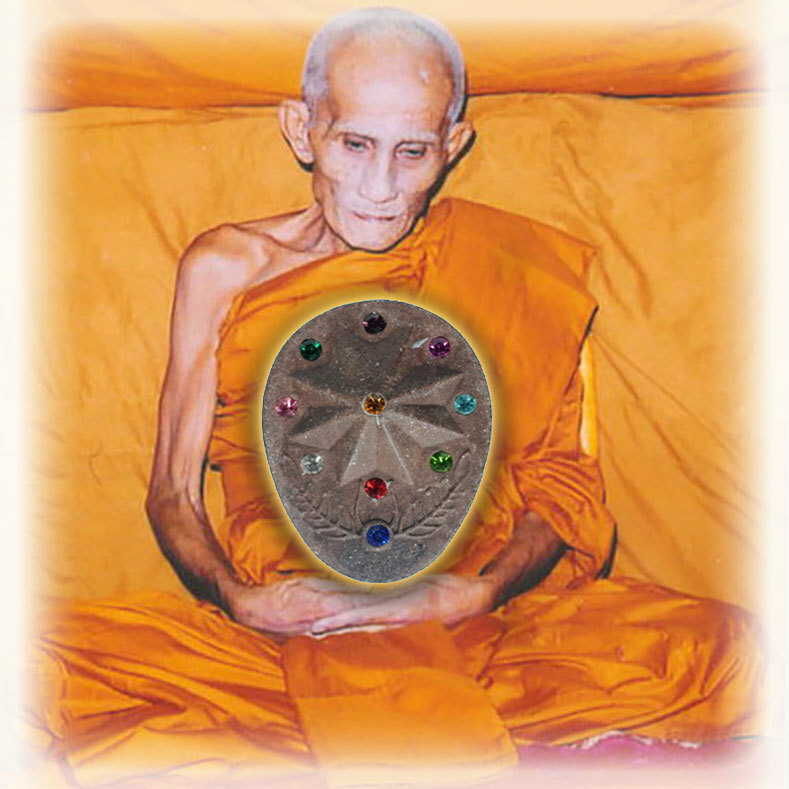 The Buddha holds a Crystal Chakra Disk at the chest. This Manifestation brings Maha Amnaj, Serm Yos Status Imcrease, and instills respect in those arpund you. Below the Buddha, is the Dharani Earth Goddess, representing the victory over all Maras and Evils.The other figure is that of Pra Mae Posop, The goddess of the harvest and fertility. This goddess represents the horn of plenty, to always have enough sustenance for one's needs. Above; Pra Sangkajjai is accompanied by the Kata Pra Sivali NA CHAA LII DTI on the rear face of the amulet, and the numbers 1 and 2 for the moon and sun. A Trishul trident is above Pra Sangkajjai. The rear side of the Amulet, has Pra Sangkajjai Buddha, and the Kata Pra Chimplee (Pra Sivali) 'Na Chaa Lii Dti'. The numbers 1 and 2 are embossed, representing the moon amd the sun. To bring guiding light in the night amd the day. 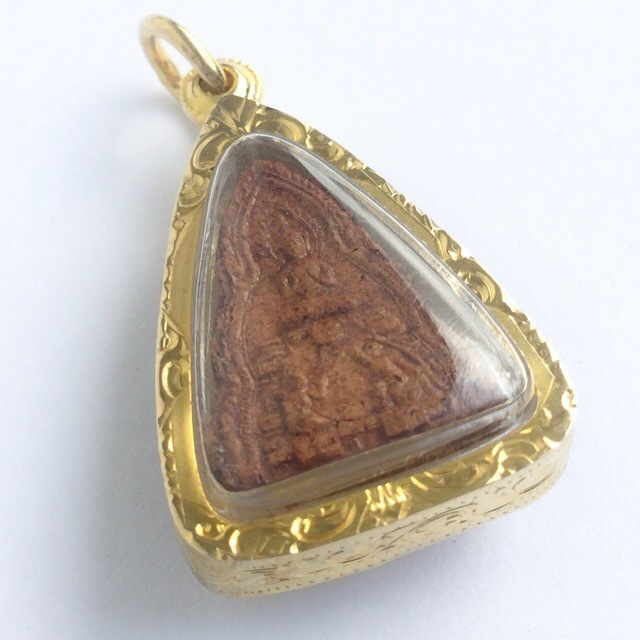 These amulets are highly regarded for their Metta Mahaniyom, Maha Lap Klaew Klaad and Maha Pokasap Powers as well as the obvious Power of Serm Duang ability to improve fate and destiny. They are filled with Puttakun Blessings of the Buddha, and offer Protection and Prosperity. Made from extremely rich admixture of sacred earths and magical Muan Sarn powders. 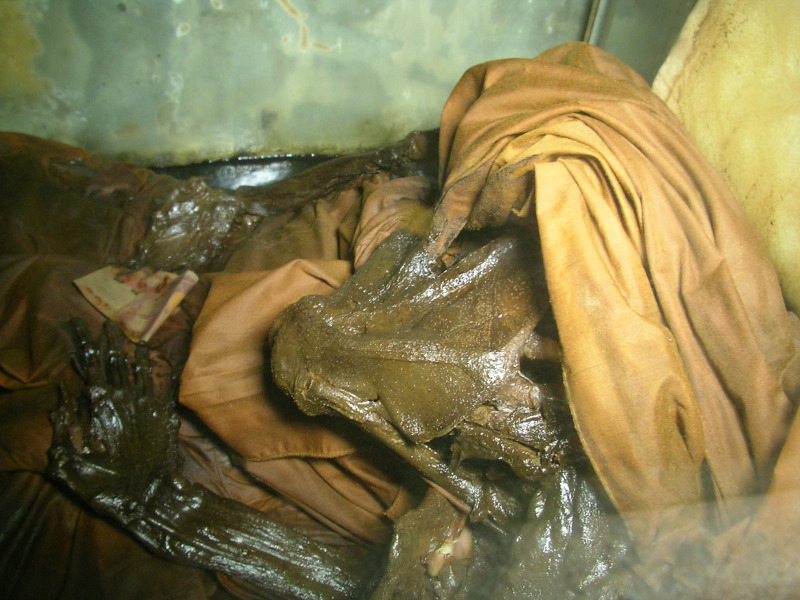 Above; Close up of the Muan Sarn and Mildew Stains on the surface of an authentic example of the Pra Pim Prasut Luang Por Pina.